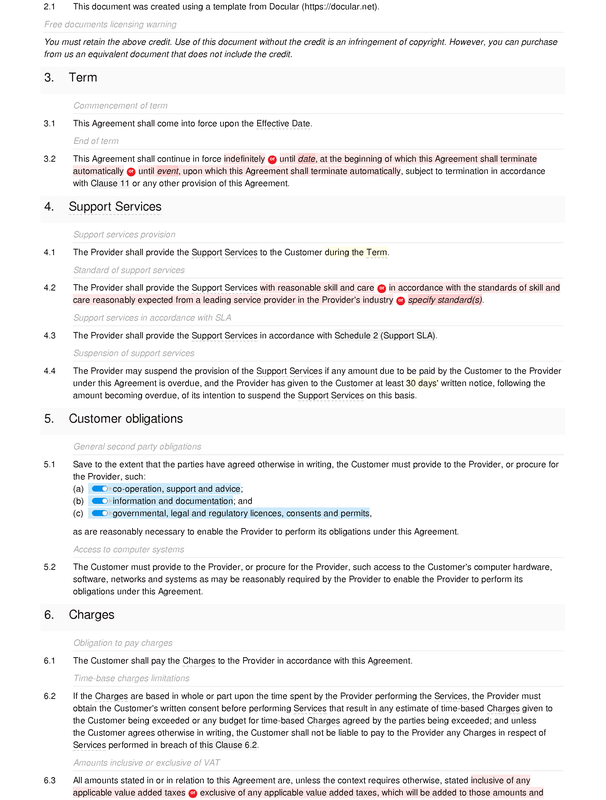 A free, short-form software support services agreement. 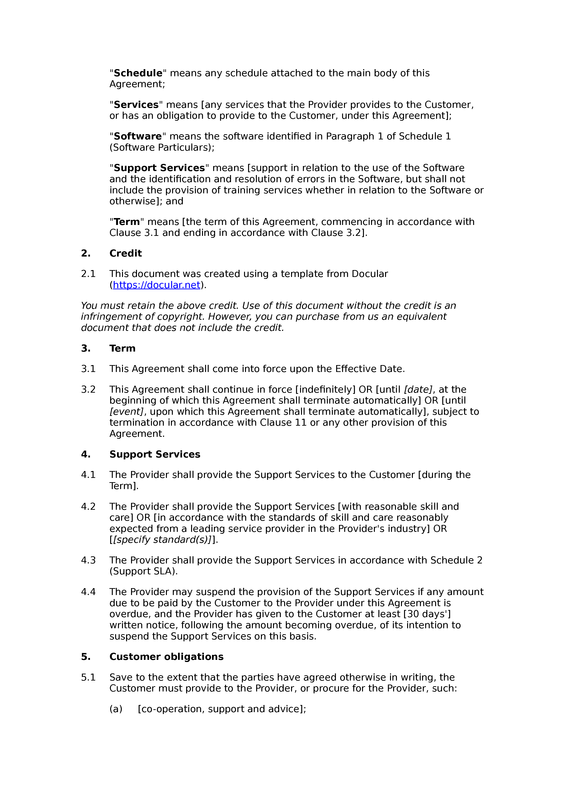 The document may be used in relation to the provision of helpdesk-based support services for software. It is not intended to cover software maintenance services, or indeed any other software-related services. 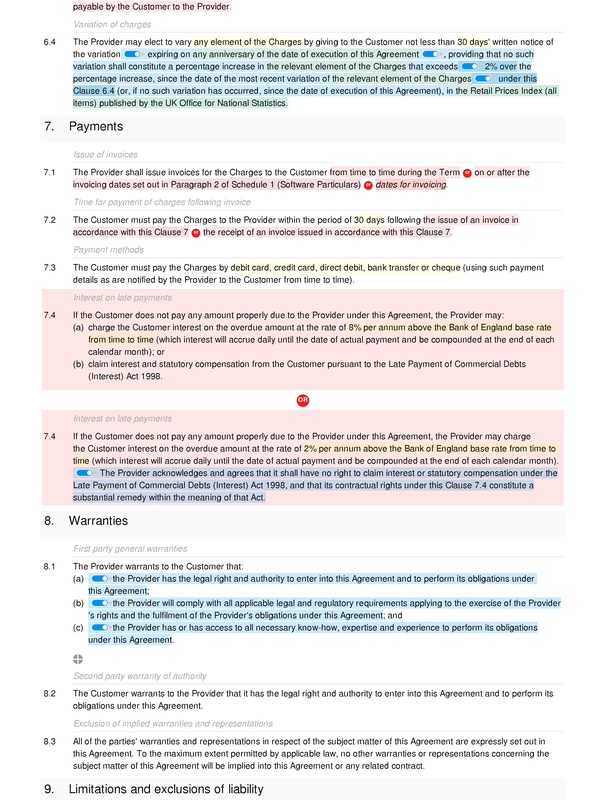 This document is substantially identical to our basic software support agreement, but with the edition of an SEQ legal credit, which under our licensing terms you must retain in the document during use. 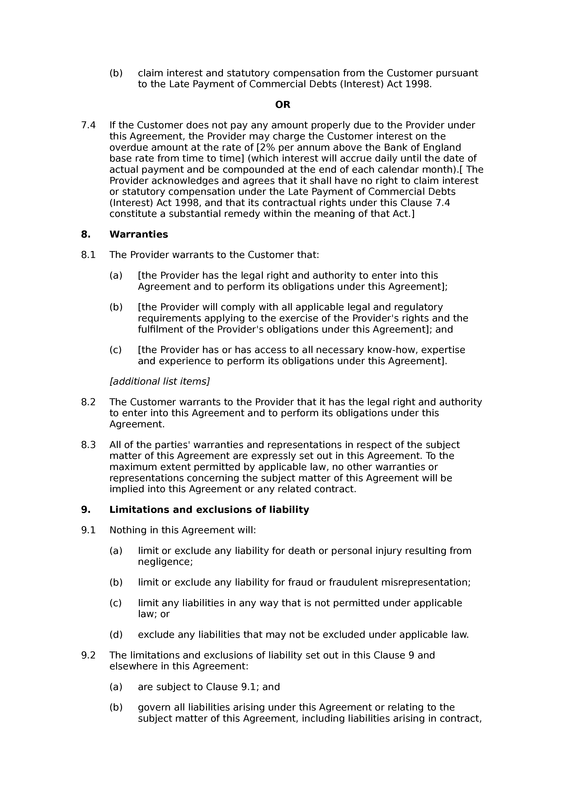 This agreement is not suitable for use where the service provider will be acting as a data processor with respect to personal data supplied by the customer. 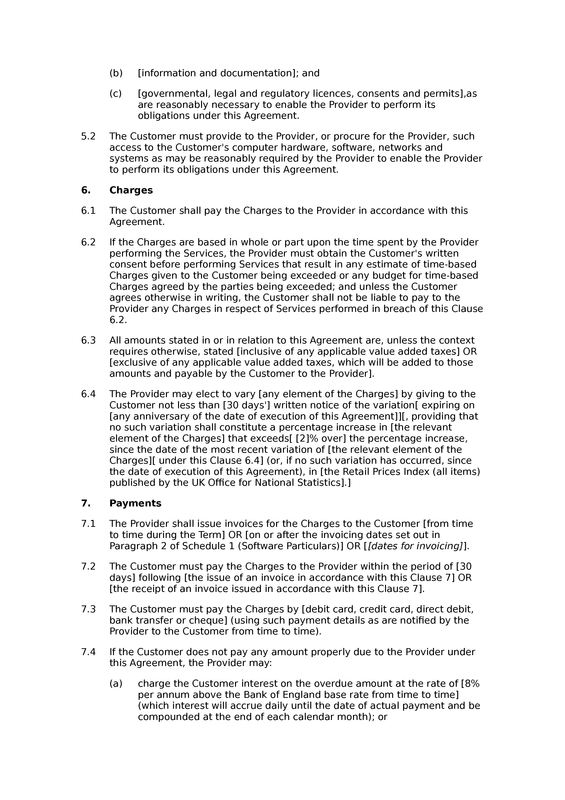 In these circumstances, data protection law requires the inclusion of certain clauses in the contract. 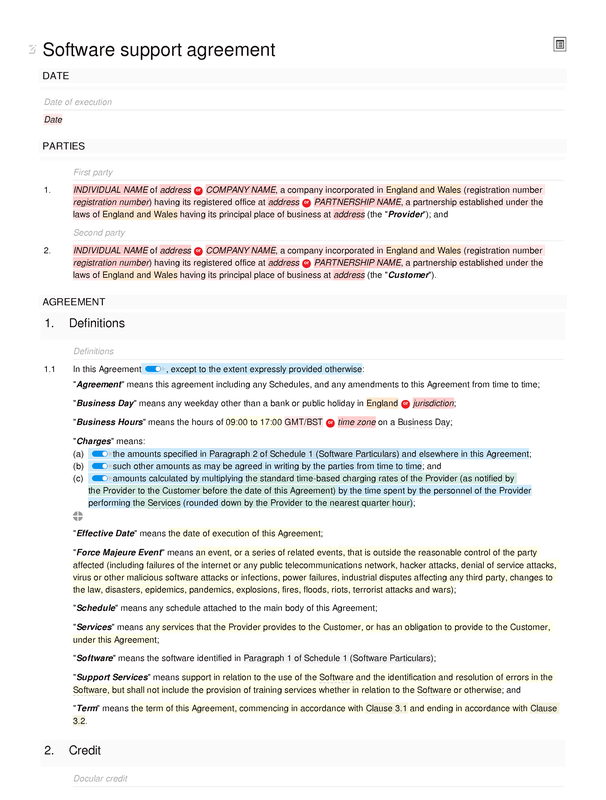 Such clauses are included in some of the longer versions of this agreement that we publish (namely, the software support agreement (standard), and the software support agreement (premium). Support Services: support services provision; standard of support services; support services in accordance with SLA; suspension of support services. obligations: general second party obligations; access to computer systems. Charges: obligation to pay charges; time-base charges limitations; amounts inclusive or exclusive of VAT; variation of charges. Payments: issue of invoices; time for payment of charges following invoice; payment methods; interest on late payments; interest on late payments. Warranties: first party general warranties; second party warranty of authority; exclusion of implied warranties and representations. 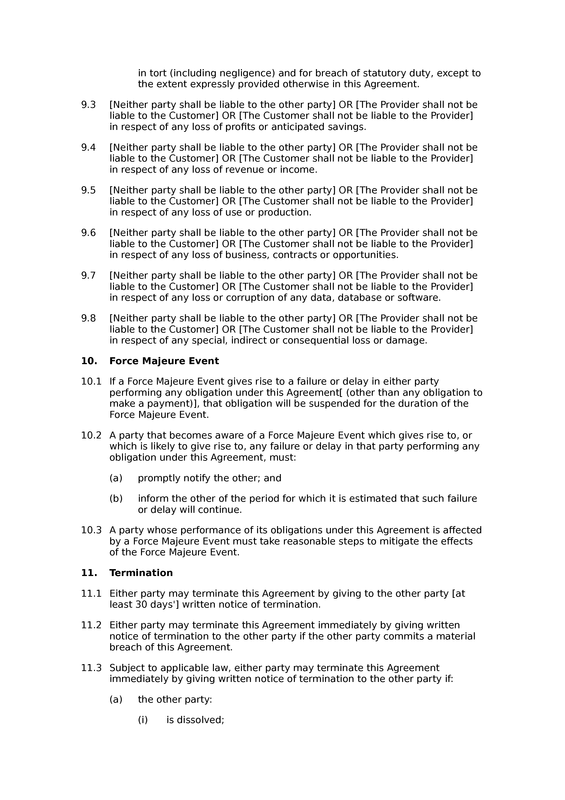 Limitations and exclusions of liability: caveats to limits of liability; interpretation of limits of liability; no liability for loss of profits; no liability for loss of revenue; no liability for loss of use; no liability for loss of opportunities; no liability for loss of data or software; no liability for consequential loss. 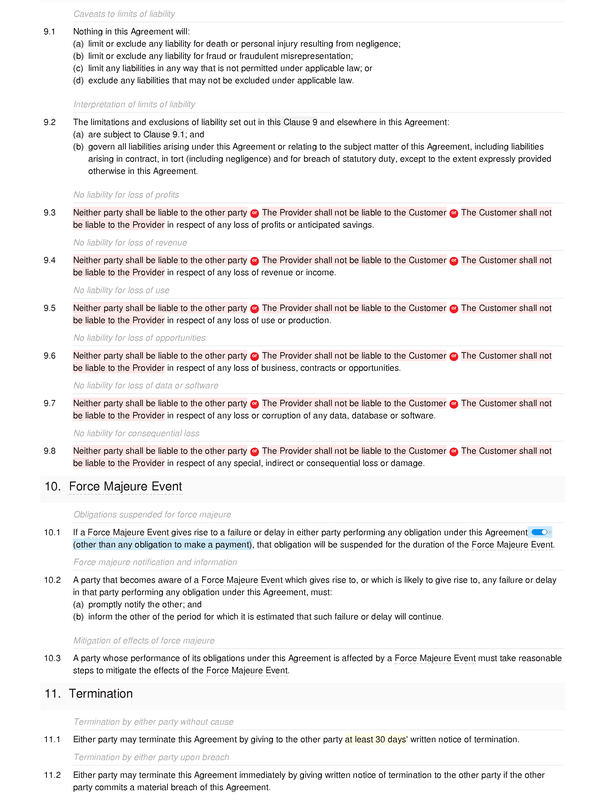 Force Majeure Event: obligations suspended for force majeure; force majeure notification and information; mitigation of effects of force majeure. Termination: termination by either party without cause; termination by either party upon breach; termination upon insolvency. Effects of termination: surviving provisions upon termination; termination does not affect accrued rights; charges on termination of contract. 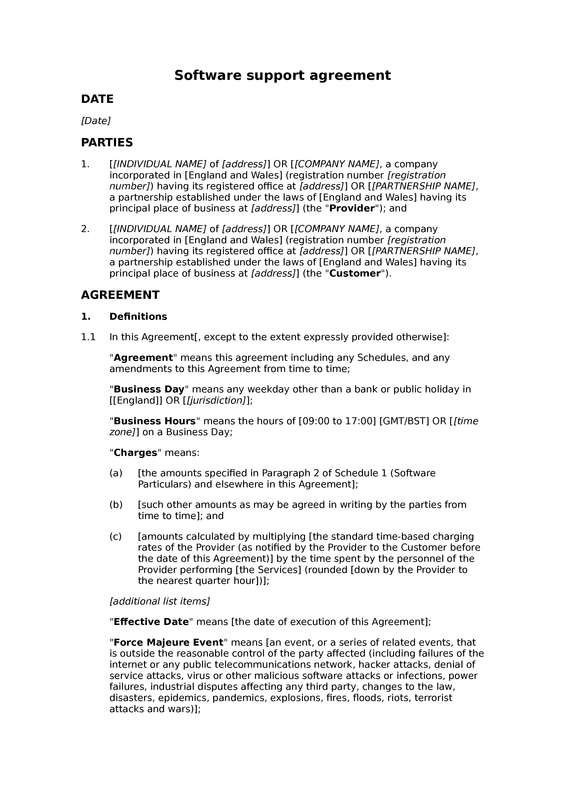 Notices: methods and deemed receipt of contractual notices; contact details for contractual notices; substitute contact details for notices. 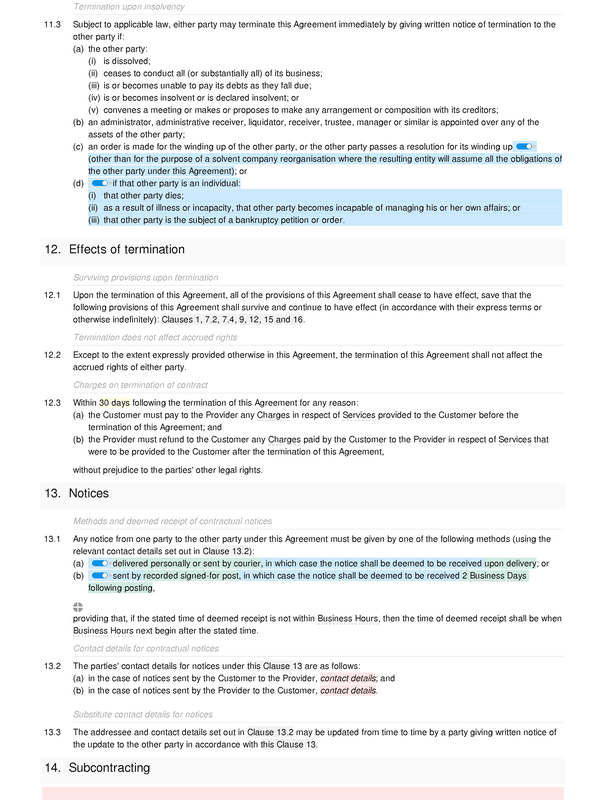 Subcontracting: no subcontracting without consent; subcontracting permitted; first party responsible for subcontracted obligations. Identification of Software: identification of software prompt. Financial provisions: financial provisions prompt. Introduction: introduction to support SLA. Helpdesk: helpdesk obligation; purpose of support services helpdesk; access to helpdesk; times of helpdesk availability; all requests for support to go through helpdesk. Response and resolution: software support issue categorisation; allocation of support issue severity categories; support response times; contents of response to support request; support resolution times. Provision of Support Services: support services to be provided remotely. Limitations on Support Services: excessive use of support services; specific exceptions to support services; support services and unrelated issues.